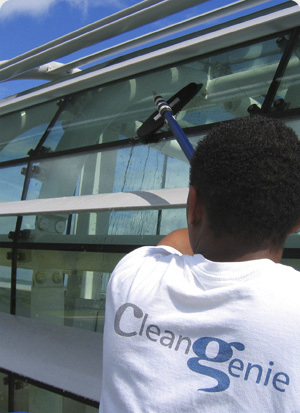 Utilising all kinds of access platforms for difficult to reach areas with the minimum of noise and disruption we supply an efficient, safe and high quality window cleaning service. Glass and Carbon Fibre composite water fed poles telescope up to 60ft (6th floor) using purified water to supply pure water to the window via a double trim brush. Pure water possesses a strong urge to return to its former impure state, absorbing dirt left behind by the elements. Because of the use of pure water the surface will dry to a spotless, streak free finish! Originally developed as an outdoor pursuit, now used worldwide in the commercial cleaning industry, abseiling allows our cleaners to reach many areas considered inaccessible in the past. We can clean windows, atria, panelling canopies and facia - and all to a spot free finish. There are many cradle designs, including rope and wire rope (with wire rope generally operated by an electric motor). Hydraulic platforms powered by electric or diesel reaching heights of 45 feet to 120 feet. When truck mounted they can reach elevations in excess of 120 feet. For temporary use and in confined spaces where there are many obstructions, you still cannot beat a ladder. No detergents or chemicals are used, and no detergent residue means that windows stay cleaner for longer.